7. I used to believe that I was magic. Cameron recently reminded me that I am. 8. I wanted to write childrens books when I grew up...someday maybe I will. 9. I absolutely love to mow the lawn. 11. Amazing Grace is an all time favorite song. Especially played on bag pipes. It makes me cry. I want it played at my funeral. 12. I want to get a new tattoo. It is going to be the celtic trinity symbol on my lower back. I want to do it before I go to Ireland. 13. There are gnomes and fairies that live in my woods. Cam, Ty and Leo and I have seen their houses and seen where they dance at night. 14. My favorite color is blue. the blue that happens just before the sun rises. not midnight blue but almost. 15. I believe in God. 18. I enjoy my new job...who would have thought! 19. I wish I could get my belly button pierced. 20. I miss my Grandma. She is in Anchorage but I dont get to see her often enough. 22. The attorney I work for called in today...today is going to be a slow day. 23. Thank you Lord for sparing that dog last night. I hit a dog on the way to Tylers hockey game. I couldnt bring myself to call the owner later to see if he was o. Leo called for me and he is doing fine. I dont ever want to drive down that road again. 24. I am trying to decide if I should run for Secretary on Tylers hockey team for high school. 25. I miss my friend Shaune. It was a pretty good game...still too many penalties! I only watched two periods though so I had to wait for Ty to call with the game report. Cam was tired, so was I! Plus on the way to the game I had hit a beautiful Golden Retriever that I saw to late. I was so upset. We followed the dog to his house and talked to his owner and all I wanted to do was call when we got home to see how the dog was doing. Thankfully he seems sore but is doing good. It still is very upsetting...I dont think I will ever be able to drive down that road without thinking about it. We are playing Lathrop....Man I hope the boys play big! NORTH POLE — The North Pole Patriots were shell-shocked in the first period, but the hockey team’s players and coaches all wore smiles after their third loss of the season. North Pole couldn’t overcome a poor first period Friday night as it lost to the Dimond Lynx, 5-4, in the Polar Ice Center. The losing effort, however, was cause for enthusiasm for the Patriots. The Lynx took a commanding 3-1 lead by the first intermission and looked as though they would to turn the game into a rout. The second period saw no scores, but plenty of action as each team dished out hard collisions that knocked some players to the ice and sent others airborne. In the third, North Pole outscored Dimond 3-2 with goals from Vance Bridgman, Hank Parra and Cody Kurkowski. The Patriots never had a chance to tie the game because Kurkowski’s goal slipped in as the buzzer sounded. Storey said keeping pace with a perennial state tournament contender would help the Patriots as the playoffs near. “You hate to lose, but to come back like that ... it’s something to build on,” he said. Another building block for North Pole could be its newest arrival, Dylan Longoria, who tabbed three assists in his second game this season. Dimond coach Dennis Sorenson said he experimented with line changes during the second and third periods, which explained some missteps. “We were good early, but it kind of went downhill from there,” Sorenson said. North Pole put the first goal on the board at 11:42 of the first stanza during a power play when Dylan Longoria fired a shot from high in the slot that was partially blocked by a defender. But it dribbled by, took an odd bounce off another Dimond player and Jordan Pascoe tapped it into the net. The Patriots, though, had trouble with their penalty kill in the first period and the Lynx scored on their first two power plays to open the game. Dimond’s Scott Wamsganz was the first to capitalize when he scored on a shot from the blue line that found the high right side of the net at 10:39 of the first. Mobley kept the Lynx perfect on the power play when he exited the penalty box and skated to the left circle, where he was met with a pass and flipped the puck in. After Mobley’s goal, North Pole’s penalty kill shored up because of “quick adjustments,” Storey said. Carnley said he focused on keeping the puck away from Wamsganz and Erik Cooper (who had three assists) and being aware of Dimond’s back-door opportunities. But North Pole was unable to strike back because it spent most of the remainder of the first outmanned. The Patriots had nine penalties through the first two periods. Mobley led the Lynx offensively with two goals and an assist. Austen Burgh had a goal for Dimond. Kyale Swenson had two helpers and Cole Christianson added one. Pascoe, Parra and Drew Donovan had assists for the Patriots. Junior Marcus Holzschuh, usually a backup, had 23 saves as he backstopped the win for Dimond. North Pole goalie Phoenix Copley took the loss with 28 saves. The Patriots (15-3-0, 4-1-0 Mid Alaska) sit in second place in the MAC and can gain ground on first-place Lathrop when they play the Malemutes on Tuesday at the Polar Ice Arena. North Pole faces another challenge from Anchorage today when it hosts the Service Cougars at noon in the Polar Ice Arena. Dimond (17-1-0, 9-1-0 Cook Inlet) will play Lathrop in a showdown today in the Big Dipper Ice Arena at 1:30 p.m.
Stumble It! FAIRBANKS — The North Pole Patriots kept their Mid Alaska Conference title hopes alive with a 7-2 win over the West Valley Wolfpack on Tuesday at the Big Dipper Ice Arena. North Pole jumped out to a 3-0 lead after one period and never looked back. “The kids came out fired up,” head coach Jason Storey said. A strong forecheck helped get the Patriots going. “We were able to put the puck in deep and get after it,” Storey said. North Pole had a 37-20 advantage in shots for the game and only gave up two attempts in the first period. 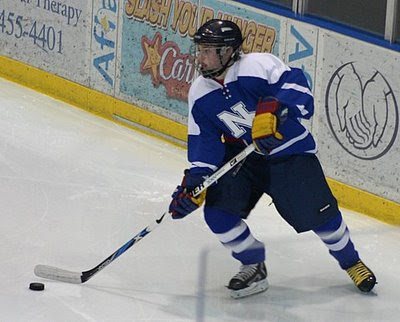 Leading the North Pole offensive attack were Matt Sanford and Hank Parra with two goals apiece. Seth Haines, Jared Linnell and Dylan Longoria added single tallies. West Valley got goals from Johnny McGee and Ben Henne. Phoenix Copley had 18 saves for North Pole while Cacy Wilfer of West Valley stopped 30 shots. North Pole improved to 15-2 overall and 4-1 MAC in advance of next week’s showdown against Lathrop at the Polar Ice Center. Look how handsome Tyler is! North Pole jumped out to an early lead and never looked back as the Patriots improved to 3-1 in the Mid Alaska Conference with their win over the Hawks. Some of North Pole’s younger players made big contributions to the winning effort as Nick Crutcher had a goal and three assists, while Alex Lemlin, Tyler Keturi and Austin Wood each netted a goal. Jared Linnell and Vance Bridgman each scored three goals, with Hank Parra getting two and DJ Carnley scoring the other. Goalie Phoenix Copley registered 13 saves in the shutout. The Patriots also play Service and Dimond next weekend. Tyler makes Alaska Select 16 team!